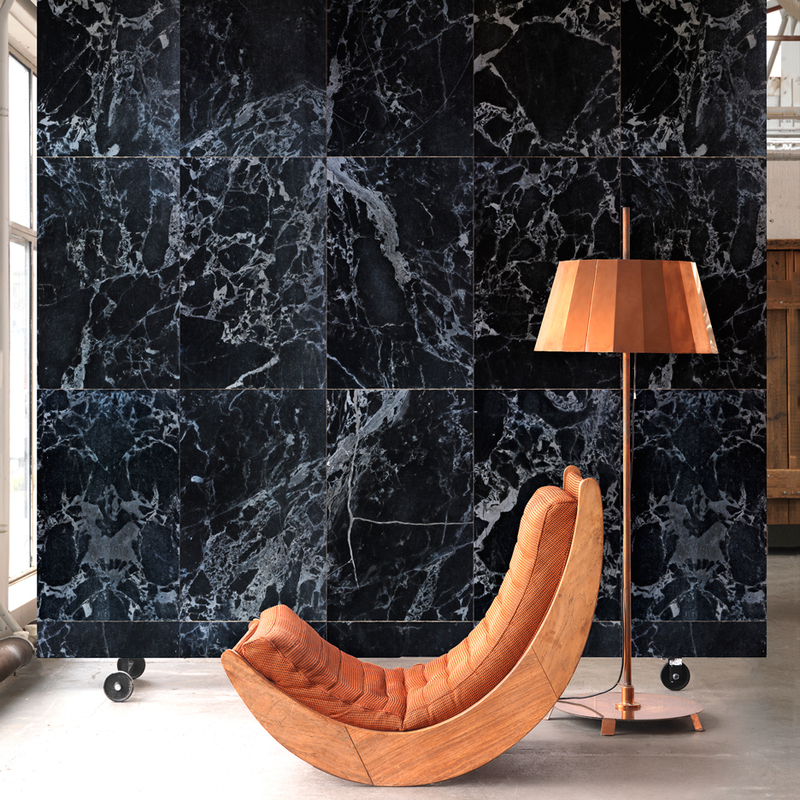 Dutch Design Week 2015: Dutch designer Piet Hein Eek has partnered with manufacturer NLXL to create a collection of wallpapers that resemble architectural materials such as marble, brick and wood. The collection of eight designs includes black marble, white marble, black brick, silver brick, burnt wood and blue painted wooden floorboards, with a further two yet to be announced. All of the papers create a tromp l'oeil effect – appearing as three-dimensional images but on a flat surface. Eek – who previously worked with the Dutch wallpaper company to release a range of weathered-wood designs – sourced the images of bricks and blue timber from surfaces in his own workshop in Eindhoven. "We have a lot of brick walls. Not the nice New York exposed brick kind, but the ugly kind. We decided to simply paint them black," said the designer. "People ask me for a blue wallpaper all the time, so when these blue planks came in at the workshop I knew we had to do it," he added. The imagery for the black and white marble wallpapers was scanned from the floor of an old building in Amsterdam. "When they cut marble they cut slabs of stone, so if you take two consecutive slabs and flip them you get a mirror image," NLXL creative director Rick Vintage told Dezeen. "So there's one roll of marble wallpaper, and another roll that's the mirror image of it, and in marble they call this an open book," he added. "It becomes almost a kind of graphical illustration." The wallpaper has been installed in Eek's factory in Eindhoven ahead of Dutch Design Week, which takes place from 17 to 25 October 2015. "A lot of companies have made marble reproduction products, but never in the way we envisioned it," the designer commented. "So we decided to give it a try. When the printing proofs came in we had the exact same thrill as we had five years earlier with the Scrapwood Wallpaper. You just want to install it everywhere," Eek added. A previous NLXL designer collaboration saw Studio Job raid its archives to use drawings, icons, images and patterns to create nine-metre running compositions without any repetition. Eek is also currently working on a collection of limited-edition furniture for Ikea, set to be released in 2017, and has just completed a conversion of an old mill in France into a pair of holiday homes.